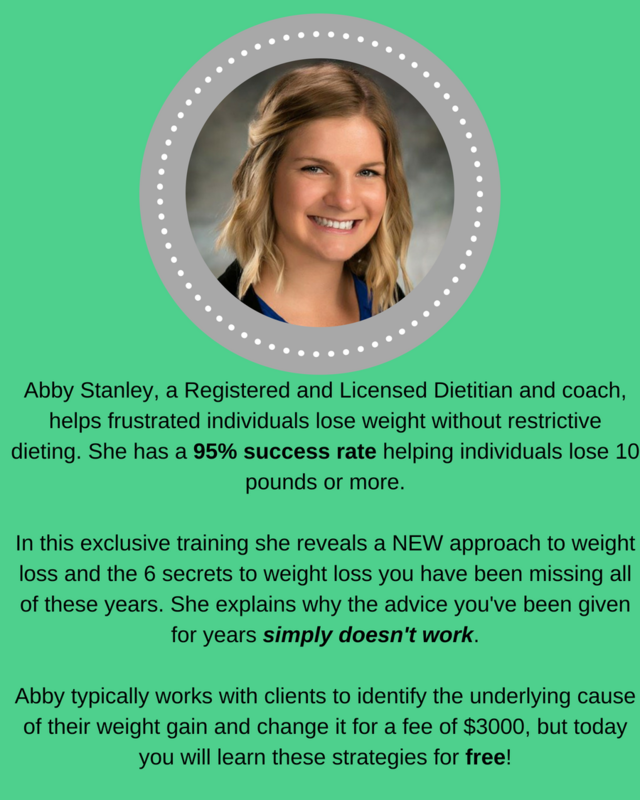 Dietitian Abby presents this FREE online training! How women who have more than 15 lbs to lose and have been fighting the diet battle most of their lives can finally lose the weight and inches, keep it off for good, all while having a sane and fulfilling relationship with food! Discover the 6 missing secrets to losing weight in as little a 30 days AND be able to keep it off for good! Learn why losing weight has NOTHING to do with calories or even how much you eat. And what you should REALLY focus on in order to lose weight! Find a direct path to solving your weight loss problem, without having to being a restrictive diet! 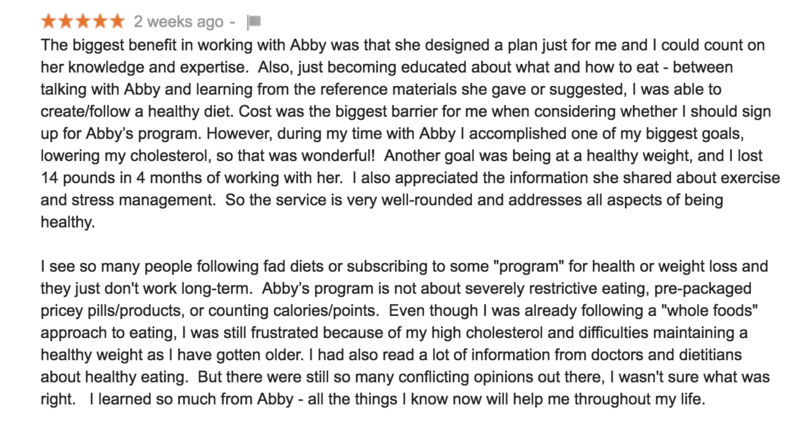 Hear from REAL clients who saw success with the NEW APPROACH to weight loss! Learn the proven, highly effective and personalized way to take control of your health and lose weight today! Discover why Weight Watchers, South Beach Diet, Nutrisystem, SlimFast, ItWorks, The Zone Diet, Shakeology, Advocare, Isagenix, Herbalife, Plexus, and more DON'T WORK for lasting life-long weight loss! Get access to the top secret weight loss info that NO ONE, not even your doctor, has told you before! Space is Limited and Spots Typically Fill Up FAST! Make sure to reserve your spot today! 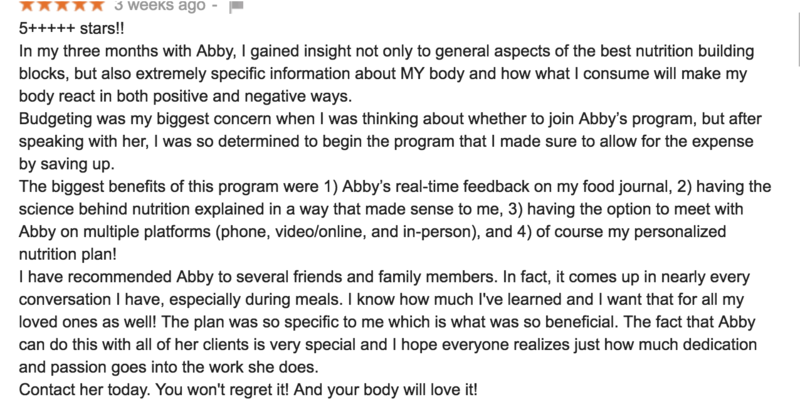 98% of Abby's clients lose weight within the first 2 weeks! If you think you've tried EVERYTHING to lose weight and still had no success THIS TRAINING is a MUST WATCH! Is what you're currently doing working? If the answer is no, REGISTER NOW!